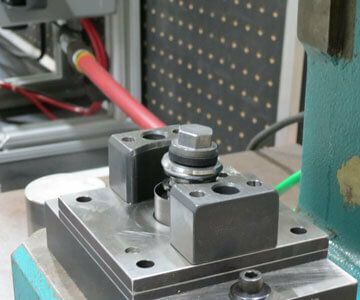 Correctly maintain the inside diameter of this part during production. Ensuring tabs meet designed placement and tolerances for proper thread alignment. 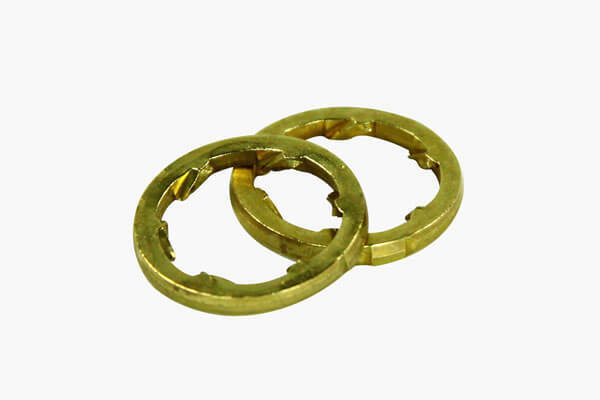 Find a high-quality, reliable supplier to stamp this part to match its design. 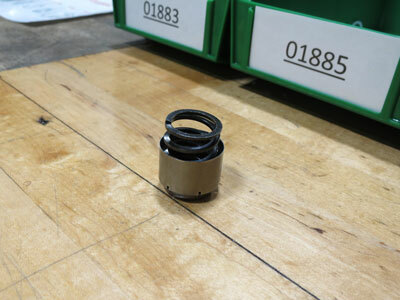 This would allow for the thrust ring to precisely fit in its required position during assembly and for perfect thread alignment in the final mechanism. 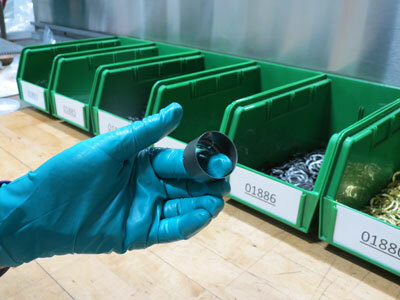 It would be ideal to find a manufacturer that could also handle final assembly for less interruption and reduced costs. 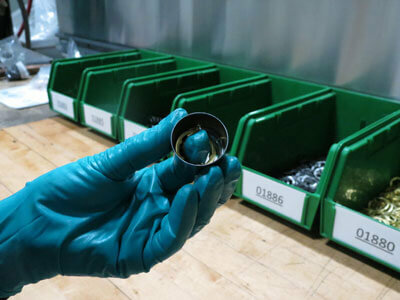 Collaborative sessions with the customer helped Ultra fully understand the functionality and features of the thrust ring and established a productive setting for die designing and building. 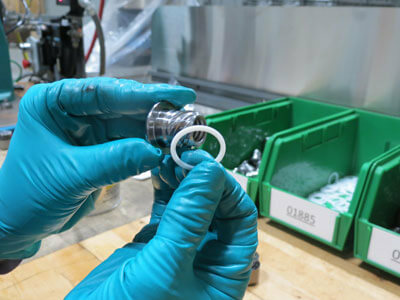 It was identified that the part’s tabs required a tight tolerance of no more than .062” to achieve correct alignment with threads during the multi-assembly process. A total of seven individual parts needed to function individually and simultaneously interact together for the final mechanism to work perfectly. Ultra designed and built a progressive die based on coining operations because this method is better suited for attaining features with very close tolerances as well as maintaining an exact inside diameter. Both these factors were of critical importance in the functionality of the thrust ring. Ultra designed and built a station in the die after forming was complete to keep the circle open to its specified inside diameter for the remainder of the production process. 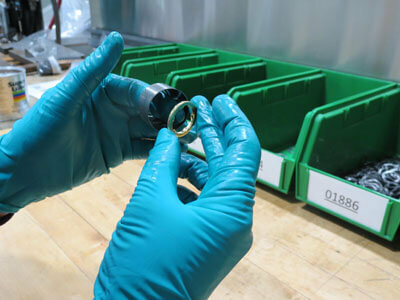 This production method allowed for greater precision and accuracy in the formation and placement of the tabs on the thrust ring. 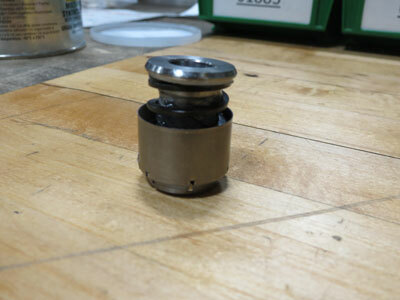 It also allowed for adjustment to the tabs as needed for consistency on each thrust ring. 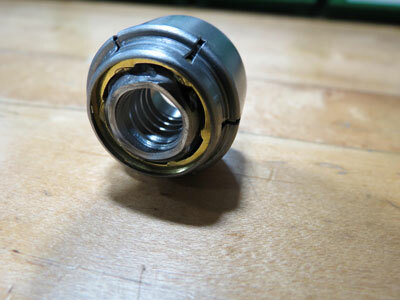 The tolerance of no more than .062 on each tab was critical to eliminate backlash during assembly with the threaded part. Again, maintaining a focus on the functionality of the thrust ring and the final mechanism was key to the success of this project. We also provided the customer with the opportunity to assemble the final mechanism at Ultra for continued consistency and quality. 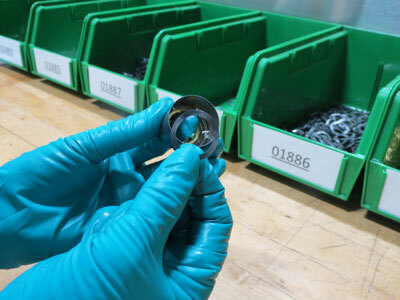 A step-by-step manual assembly process took place in our value-added department. Our tooling department designed and built customized inspection equipment to ensure the final mechanism operated correctly. 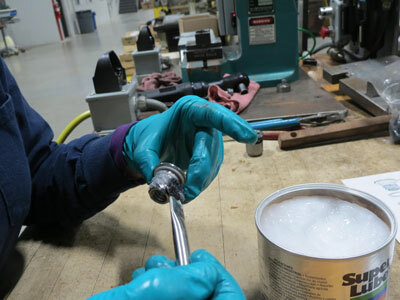 The customer was able to keep most of the manufacturing process at Ultra’s facility for quicker lead times, greater consistency and higher-quality results. 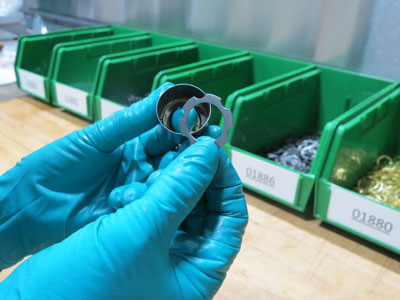 Their custom progressive die continuously produces thrust rings that meet the part’s design print at a reduced cost. department designed and built customized inspection equipment to ensure the final mechanism operated correctly. 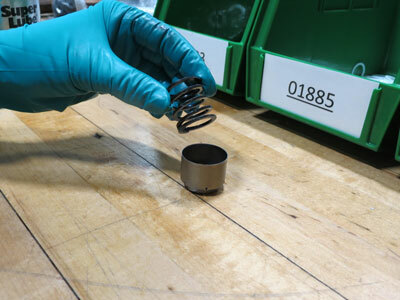 The governor weight plays a critical role in an engine’s performance and the slightest deviation can lead to engine failure. The following issues needed to be fixed to maintain the engine’s reputation for quality and dependability. There was increasing variability when welding the hinges onto the footboards and this was risking the quality and functionality of the part. Manufacturing costs were growing to an unacceptable level as production quantities continued to increase.